The anonymous donor was 3 and her sister 10 when this house was made as a Christmas gift. The donor who is being referred to by “M” is 98 now and has donated it to the Your Home Public Library in Johnson City for a raffle. M’s mother and father constructed, furnished and decorated the house themselves, except for a few items of commercial furniture that were available in the 1920s. Her mother made all the fabric items, even some impossibly small crochet items. M recalls that she and her sister were taught to “be careful” while they were playing with their toys. Even though the sisters were seven years apart in age, they played well together. It was clear to them that, although this was “their” house, it was also a work of art to their mother, who was a painter. As the girls grew up, they developed an interest in “modernizing” the décor. They refinished the walls to look like the “rough plaster” that was popular in 1929. They modernized the kitchen with cardboard “built-in” cupboards. After M’s sister had graduated college and was married, she would purchase tiny detailed dishes of food for the house. Neither sister ever lost her delight in simply looking at the house and contents. M does have a couple regrets regarding the doll house. Her father had wired the house with a string of Christmas lights, one bulb in the ceiling of each room. Eventually the cloth covered wiring seemed old and unsafe, so M had the house de-wired. This diminished the atmosphere inside the house. The old tin stove in the kitchen was discarded. All the original bathroom fixtures were replaced, but the medicine cabinet is original. 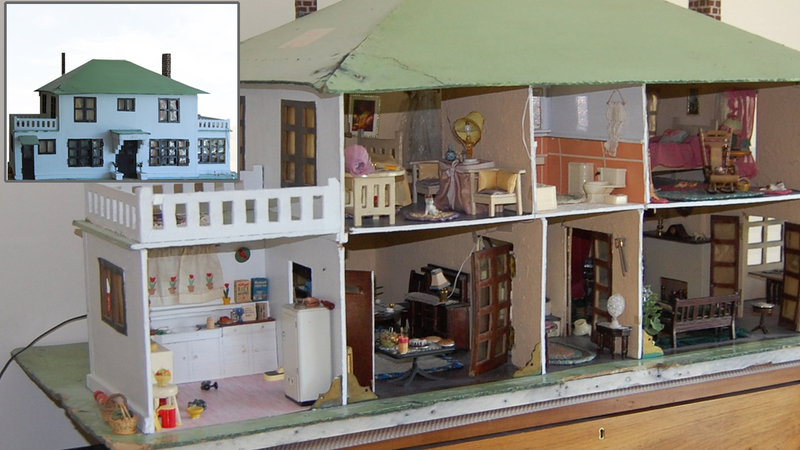 M said when she starts to reminisce about the doll house, the stories simply bubble up. She is hoping the doll house gets a new home where it will be marveled at for another 95 years!